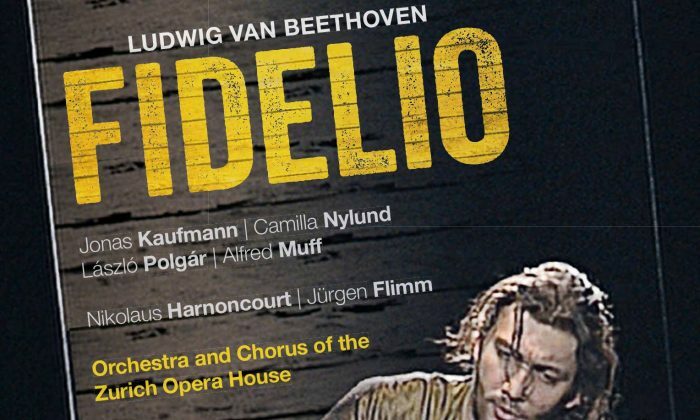 One of the roles German tenor Jonas Kaufmann has been most closely associated with is Florestan in Beethoven’s “Fidelio.” Arthaus Musik has just released a DVD of a 2004 performance of the opera at the Zurich Opera House with Kaufmann and a strong cast. This version should not be confused with the Salzburg production in 2015, also with Kaufmann, which was booed by the audience. The anger at that performance wasn’t directed at the singers but at the director, who replaced the spoken lines with recorded sound effects. The Zurich production is spare but thankfully conventional, presenting the opera as Beethoven intended, albeit with an expressionistic visual approach. The opera is set in a Spanish prison. The title character and central figure is a woman, Leonore, who is the wife of Florestan. The action begins on a light note, with a prison guard trying to romance Marzelline (the daughter of Rocco, the jailer). The young woman rejects her suitor because she has fallen in love with Fidelio, her father’s new assistant. Jürgen Flimm effectively directs a no-nonsense production. What Marzelline and the others don’t know is that Fidelio is actually Leonore in disguise. The heroine is there in search of her husband, Florestan. He has been locked up in solitary confinement on the order of his mortal enemy, the prison governor Pizzaro. Rocco thinks Fidelio is a good match for Marzelline and lectures the couple on the importance of money in achieving a happy marriage. Fidelio presses Rocco for permission to join him in visiting the dungeons. Rocco agrees but notes that the one exception is a man who has been incarcerated for two years and is being starved to death. Pizzaro appears with his soldiers and learns that the minister Don Fernando is going to conduct an inspection of the prison. The villain decides to immediately dispose of Florestan and tries to bribe Rocco into performing the deed. When this effort fails, he plans to do away with the prisoner himself and orders Rocco to dig a grave. Leonore hears the conversation and is resolved to save her husband’s life. Pizzaro rebukes Rocco when he finds out that the jailer had allowed the prisoners (other than Florestan) to go out into the garden. Rocco’s justification is that he granted the men a few moments of sunshine to celebrate the king’s name day. Rocco then asks Fidelio to help him dig a grave in the secret vault. Act 2 begins with Florestan in chains, dreaming of his wife coming to free him. He then sinks into unconsciousness. Rocco and Fidelio enter and, when Florestan comes to his senses and looks up, his wife recognizes him. Rocco grants the prisoner’s plea for a drink of water and Fidelio gives him a piece of bread. Pizzaro appears with the intent of stabbing Florestan to death. In a dramatic scene, Fidelio reveals her true identity as Leonore, exclaiming “First kill his wife.” Then, she pulls out a gun and points it at Pizzaro. A trumpet fanfare outside marks the arrival of the minister, Don Fernando. He orders all the prisoners released. Upon seeing Florestan, he recognizes him as an old friend he had thought to be dead. When he learns of Pizzaro’s treachery, he orders the evildoer taken into custody. Leonore removes her husband’s chains as her heroism is praised by all. The production is well acted and sung. As one might expect, Kaufmann is outstanding. His Act 2 aria “Gott! Welch Dunkel hier!” (“God! What darkness here!”) seems to explode from the depths of his soul up to the heavens. This aria is clearly the high point of the performance. However, the lead character is not Florestan but his brave wife. Fortunately, his Leonore/Fidelio here is Camilla Nylund, and she not only sings and acts with sincerity but, like Kaufmann, is also good-looking, making them a credible couple. Laszlo Polgar is fine as the humane Rocco, while Alfred Muff manages to play Don Pizzaro without resorting to snarling. Elizabeth Rae Magnuson is a charming Marzelline and Günther Groissböck is a dignified Fernando. Christoph Strehl sings well as Jaquino. Nikolaus Harnoncourt conducts with authority, and Jürgen Flimm effectively directs a no-nonsense production with set and costumes by Rolf and Marianne Glittenberg, respectively, and subtle lighting effects by Jakob Schlosstein.